THE LARGEST GATHERING of minke whales has been sighted in the waters off Galley Head in West Cork, according to the Irish Whale and Dolphin Group. Throughout April, sighting reports from skipper Colin Barnes of Cork Whale Watch routinely estimated between 20 to 40 minke whales per trip. On Sunday 29 April, when the seas were calmer, Barnes estimated even more mammals, in excess of 50 minkes at some counts. According to Pádraig Whooley – the IWDG’s sightings officer – there hasn’t just been an increase in minkes. Barnes last trip also recorded three or four humpback whales and 100s of common dolphins. Whooley says the reason there are so many minke whales here is that there is plenty of food for them. ”The whales have found an area where there is an abundance of prey, underpinning that they may be a far more complex reasoning behind it, that probably nobody on the planet understands. There is an abundance of food at the moment, it seems mostly the food is sand eels. The minke whale is Ireland’s most frequently observed whale species with Irish waters serving as a good feeding ground for them. 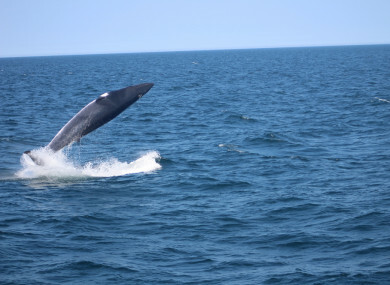 But the breeding grounds for the minke whales in the North Atlantic remains a mystery according to Whooley. The IWDG has recently identified the same individual whales in both Irish and Icelandic waters, often in the same year. Later this month the group will spend a month exploring Icelandic waters, aiming to locate humpback whales and other whale species to obtain more photo identification. There are a number of whale watching events around the country, as part of biodiversity week, which are free to everyone. Find out more here. Email “West Cork whale watchers are being treated to large gatherings during 'low season'”. Feedback on “West Cork whale watchers are being treated to large gatherings during 'low season'”.